Intracardiac devices and implants are commonly encountered in cardiac diagnostic imaging. These may range from prosthetic heart valves to ventricular assist devices. Familiarity by the interpreting physician with the normal and abnormal appearance of each device is essential for proper detection of device complications. While devices may be detected via computed tomography, beam hardening and streak artifacts may limit their full appearance, which is why it is important to know both the cross-sectional appearance and the scout or radiographic appearance of a device. 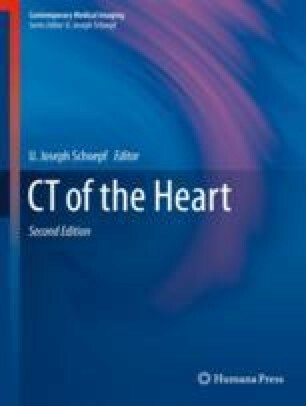 This chapter reviews the normal appearance of common intracardiac devices as well as well as frequently seen artifacts. The authors would like to extend our gratitude to Benjamin W. Cobb for his assistance with imaging acquisition.